While we have always offered a selection of fine ready-made men's clothing at Valentino Tailors, I always believed a custom suiting option would be a good fit with the services we provide. In Fall 2010, we introduced the H. Freeman line of custom suits. We chose H. Freeman for their high quality, vast selection and American make. 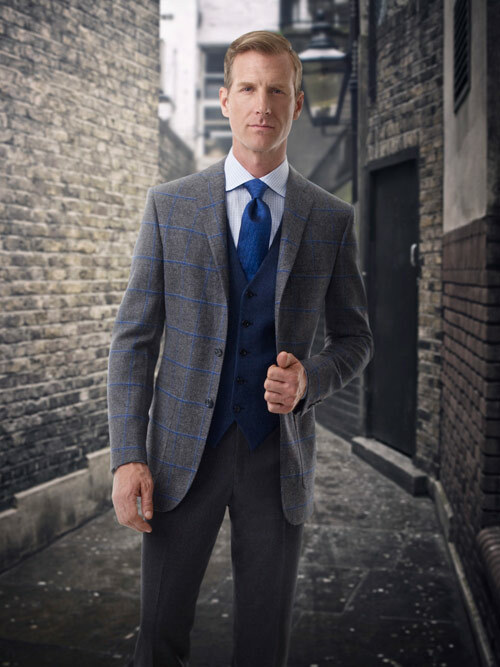 Custom suiting offers endless options for fabric, color, design details and fit. This option is perfect for those who have a challenge shopping off the rack or for anyone who wants the freedom and creativity to design their own clothing. After all, why should the jetsetters and A-listers have all the fun designing their own clothes? In preparation for our upcoming custom suiting event, we did a Q&A with our partner from H. Freeman, Miguel Pena. I certainly share in his enthusiasm for this wonderful product and service. Read on, and if you aren't already on our email list, be sure to get in touch with us! Why should men and women consider custom suiting? "First and foremost, I believe it has a lot to do with getting a garment made to your specifications, at the same price as what you can buy off the rack. How would you like to have 400 fabrics cut for you, to your specifications, versus the few that might be available off the rack? Once you go custom, you don’t go back." Where are H. Freeman Suits manufactured? "Our factory is located in Westminster, Maryland. We have 278 employees who are skilled at sewing, cutting, and custom fits. They are all skilled craftsmen and women." Why is it important that H. Freeman’s suits are made in America? It’s important that we as consumers continue to support businesses that are located here in America employing American workers. The company was founded in America, and it's nice to see that tradition continue here." How many options are available through custom suiting? "There are over 400 seasonal fabric choices and over 200 permanent choices, totaling over 600 options to choose from. The options are endless for collar and lapel widths, coat lengths, pant and skirt styles, button holes. Tell me what you want, and we can work with you. We are a classic house with a contemporary twist. We can fit anyone from a dapper dan, to a plus size man or woman. We have sufficient styles that will fit all preferences." "The ability to take a flat surface fabric and create this three dimensional garment that will now fit you- how you want it. Also the value of customer service and customer satisfaction." "Trends are tough. I think presently in suiting, you will find that a trim, well fit garment is at high demand. I do see where flat fronts have taken over the market, where a pleated trouser, whether single or double, with a trim knee and bottom will come. Fortunately, through H. Freeman custom suiting, you are not limited to the current trends. What you want now, you can get now. You are not limited to what you find in the store."